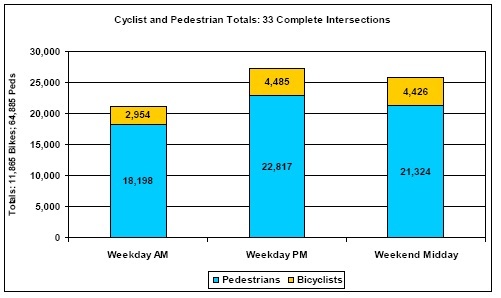 2011 City of Los Angeles Bicycle and Pedestrian Count suggest otherwise. Counts at just 33 intersections show about 20,000 peak period walkers. Pretty impressive for a city supposedly in love with the car. Although the report (understandably) focuses primarily on bike travel, it does at least provide some good base data for pedestrian travel in Los Angeles. Hopefully as Los Angeles Walks ramps ups its advocacy efforts, we'll see additional analysis for pedestrians (suggestion for next year: conducting counts during the hours of peak vehicle travel could mean we're missing some of the story about peak pedestrian and bike travel--especially since the counts don't cover the walk-from-school hours). I was particularly interested to see that in many cases the LA counts were higher than those in the US Census journey to work data, suggesting an underreporting of bike and pedestrian travel in the Census. This underscores the importance of devoting more resources to researching pedestrian and bicycle travel--without good data, we're more likely to sell ourselves short (or Congress might).